3 Kid-Friendly Kitchen Activities for You and Your Child - Mummy's Gone Mad! | Mummy's Gone Mad! Food preparation, cleanliness, and safety are core lessons any child will need to learn, yet most parents don’t feel confident that their kids are learning enough about them in school. 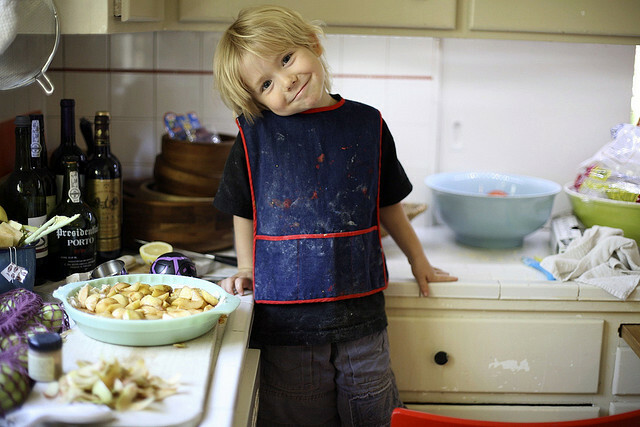 Here are a handful of kitchen-related activities you can take on with your child. Today it seems that most educational institutions are more concerned with preparing our children for the workforce than preparing them for self-sufficient and healthy living. Budget cuts have reduced cooking classes to text-books or video, leaving fewer and fewer children to possess a firm understanding of how to prepare meals safely and maintain their household. Gender sensitivities have also played a role in the deconstruction of healthy life lessons. In some schools, parents litigiously feel that obligating their child to learn responsibilities attached to specific gender roles of yesteryear are not in their best interests; as a result, programs are being dismantled altogether to avoid controversy and unwanted attention to a school board. Parents seem to be left holding the bag in terms of teaching their kids healthy activities from gardening to homemaking, so we thought we would compile a list of child-friendly kitchen-related activities that will promote independence and a better understanding of how to run a household. Before a home-cooked meal can be prepared, some basic gardening skills are required. Having a small garden in the family backyard will teach your kids how to properly care for plants, and how to exercise food safety from soil to plate. A family garden will teach your children how to grow and nurture plants, keep garden pests at bay, and manage garden space in relation to seasonal vegetables and harvest. A little trickery never hurt anyone; teaching your kids about kitchen safety is easy when it results in activities kids love –and what kid doesn’t love making things with Playdoh? Hidden within every homemade Playdoh ball is a food safety lesson. Next time you consider making Playdoh for your kids, consider inviting them along for the experience. Your child can learn their way around kitchen, and how to get their hands dirty while exercising effective food safety. Making Playdoh with your kids is the perfect “gateway” activity that will teach them all about food safety and how to get around a kitchen without them realizing they’re learning something new. Teaching your child how much time and effort goes into food preparation and food safety is another benefit of allowing your child to pull their weight in the kitchen, while enhancing their overall sense of independence. Teaching your child how to prepare basic meals and snacks will make them appreciate the hard work you put into meal preparation, while also reducing your own workload down the line. Teaching your child age-appropriate skills such as cutting and rinsing vegetables, boiling eggs, or demonstrating which ingredients go well together are all great ways to introduce your child to the kitchen. The more hands-on your kitchen training, the more safety precautions you may need to take. Age plays a big role here; cutting vegetables may require special kid-safe cutlery, and kids aprons will keep your kids safe while also making sure any kitchen activities don’t mean a higher laundry bill. There are many important lessons for your kids in the kitchen: food safety, kitchen safety, nutritional requirements, food preparation, and food storage are all skills required to live a self-sufficient life.